On sunny Tuesday, July 18th, I visited a Plastic Ocean Festival event near Paddington station, London. 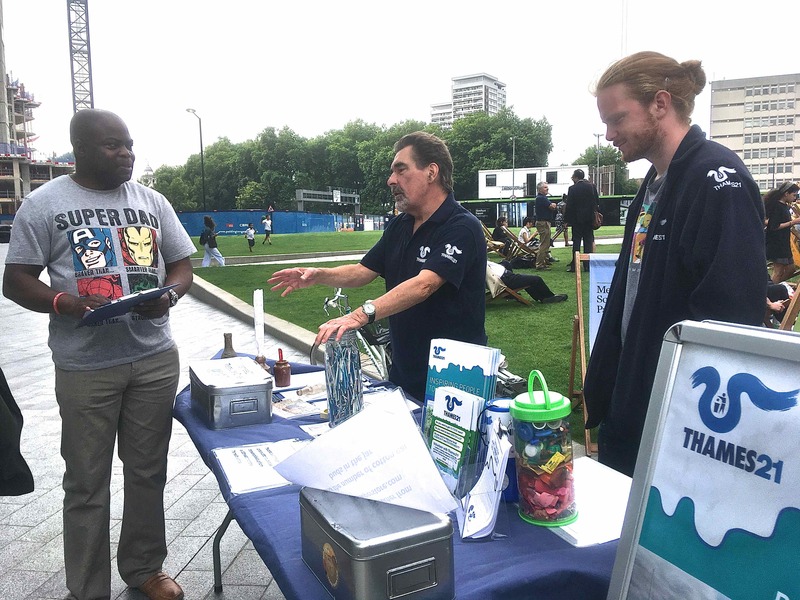 Located on the Paddington canal system, charity stalls and free outdoor movies promoted awareness of the overwhelming amounts of, and intense ocean and waterway ecosystem destruction caused by, plastics. I met with enthusiastic representatives of two outstanding charities, Thames 21 and Thames Estuary Partnership, that are both working hard to reduce plastics in our water systems in different ways. This event was one in a series of events run by the creators of A Plastic Ocean movie. Kim Ferran Holt, Marine Litter Coordinator for TEP, explained that the group is currently working with partners to run a One Less Bottle Campaign – encouraging people to refuse single use plastic bottles and carry a refillable one. You can follow their campaign under at onelessbottle.org and #OneLessBTL. Other exciting projects (among many) that TEP is partnering with include a Thames Lens Photography competition and an around Britain sailing eXXpedition that Kim will join, with 14 women sampling waters for plastics and toxins as they go. 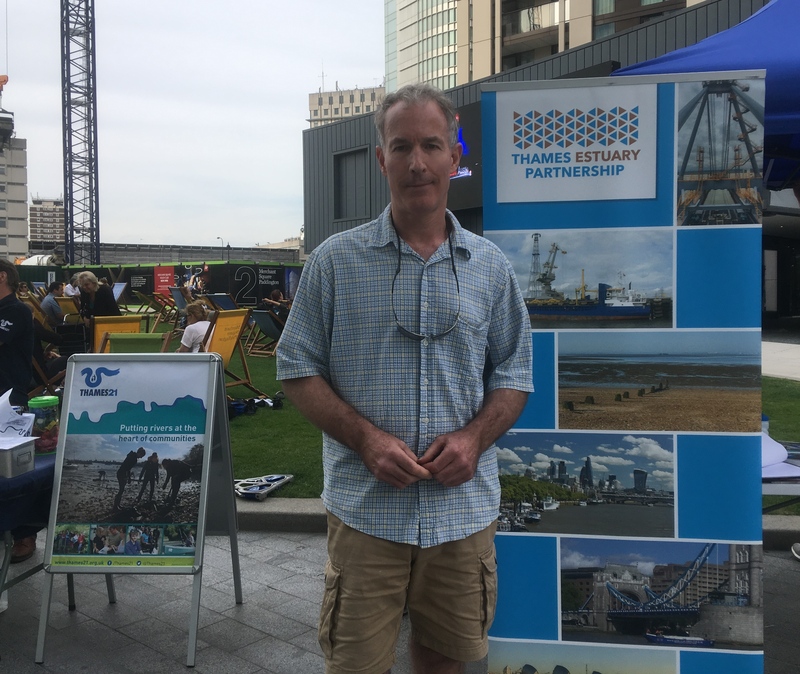 TEP is “the only non-campaigning organisation looking after one of the world’s premier rivers…provide a framework for sustainable management of the Thames.” Their “mission is to connect people, ideas and the Thames landscape…by raising awareness of estuary issues”. Nick Anthony explained Thames21’s vision is to put healthy rivers back at the heart of community life, with a four-pronged approach including clean ups, education, research and advocacy. 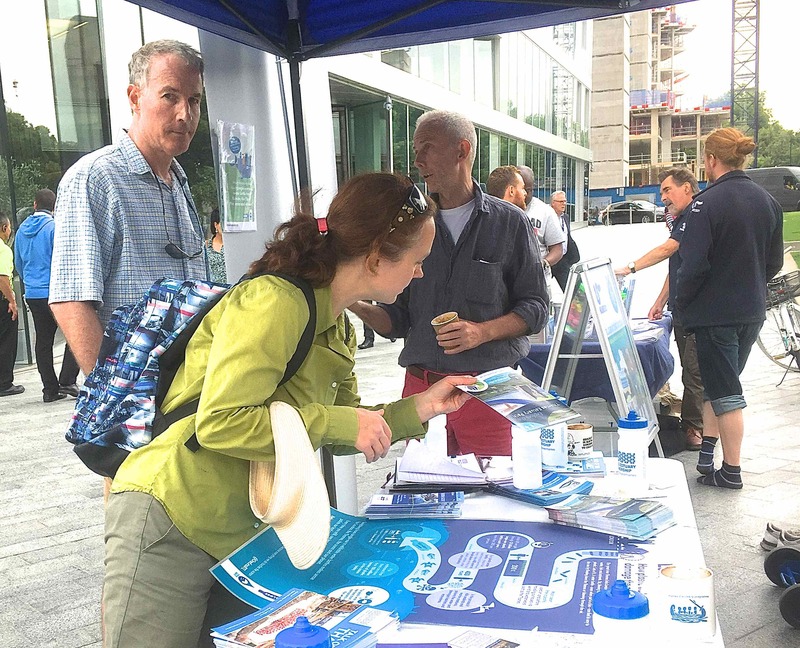 The charity also provides free training on Leading a Waterway Cleanup and gives guidance and support afterwards if you decide you’d like to lead your own cleanup at a waterway near you. Or you can just join in a project already organised in their events calendar. Every contribution helps! 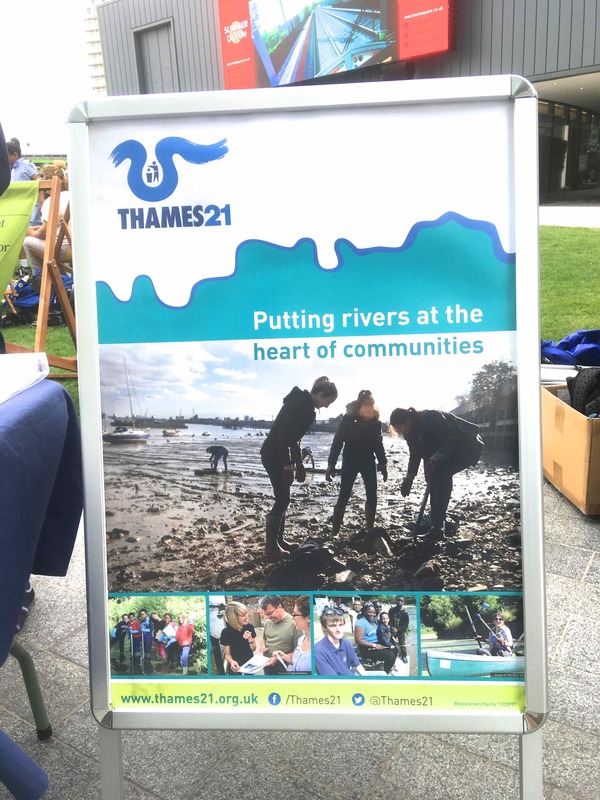 Thames 21’s tagline says: We reconnect people to nature by helping them enjoy, protect and enhance their local rivers. This compelling and informative documentary, A Plastic Ocean was shown on the outdoor movie screen on the building next to the festival area . Stomach-wrenching to watch, this high definition and well researched film delivers a strong message: The health of our oceans is not going well. Stay in touch and find out more about opportunities to help out and training at Thames 21 events on twitter, facebook and at Thames 21’s site. You can also contact them at info@thames21.org.uk or at 020 7248 7171. Find out more about Thames Estuary Partnership on twitter, facebook and at their website. 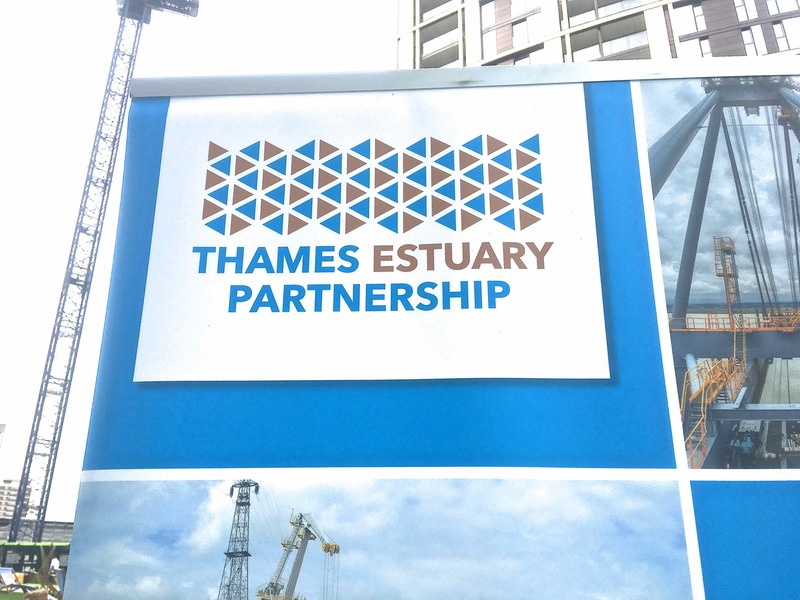 You can also contact them at tep@thamesestuarypartnership.org or at 020 7679 8855. For more Plastic Ocean events, visit the Plastic Ocean Festival site. For more information on how you can help out, check out What I Can Do.